Durable, rust free stainless steel bezel and case. Shatter proof, scratch resistant, composite plastic lens. Easy to read white face with black numerals and PSI increments. 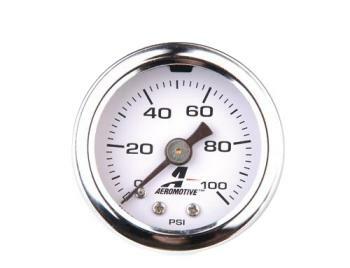 Non-liquid filled gauge for consistant readings hot or cold! Standard, 1/8 inch NPT male supports a direct connection to any Aeromotive adjustable regulator.